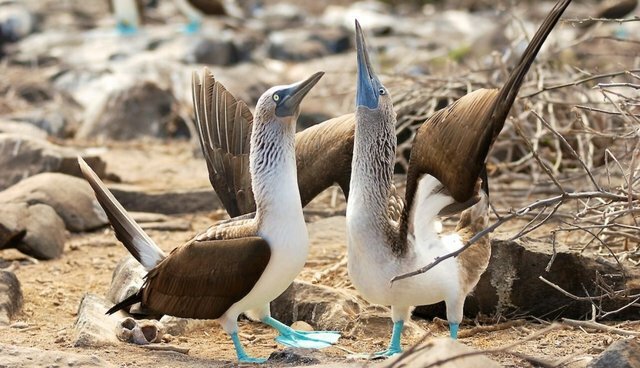 Blue-footed boobies are socially monogamous birds -- like humans, the seabirds will form pairs to raise children (and mates will also divorce in search of a better booby). But those birds that stay together longest, as scientists report in the journal Proceedings Of The Royal Society B, have the healthiest broods. For 24 years, ecologists monitored booby reproduction on an island in the Pacific. A group of Mexican ecologists reviewed the breeding data and found that the duration of pair bond -- akin to the length of an avian marriage -- affected the health and number of booby chicks. Each year, the bonded boobies laid their eggs 11 days earlier, and these eggs were also more likely to hatch. More of these chicks survived, too: Long-lasting booby pairs had up to 35 percent more fledglings. This study shows for the first time that the reproductive performance of a pair depends not just on the individual parents, the researchers say, but also on how parents work together as a team.